You must be a member of the Rome Word Games Group to attend this activity. Would you like to join this group? Looking for an opportunity to improve your Italian or your English? This is the night for you! We'll meet at 8pm to mingle & eat/drink, then we'll get into teams & play TABOO... with a TWIST; the English mother tongue speakers play in Italian and the Italian mother tongue speakers play in English! 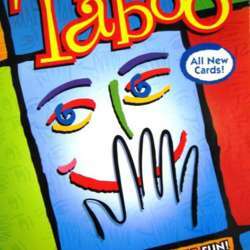 Players take turns to make their team guess as many words as possible, without using the forbidden 'taboo' words. (E.g. You have to describe 'orange' without saying: fruit, citrus, clockwork, round, county.) Each team is made up of a mixture of English & Italian mother-tongue speakers. The winning team at the end of the evening is the one which has guessed the most words. Is it a challenge? Yes. Will it take you out of your comfort zone? Yes. This event is suited to anyone with an excellent knowledge of English hoping to improve their Italian, or those with an excellent knowledge of Italian hoping to improve their English. Everyone pays for their own drinks/food. Cerchi l'opportunità per migliorare il tuo inglese o il tuo italiano? Questa è la serata per te! Ci vediamo alle h20 per mescolarsi e mangiare/bere, poi ci mettiamo in squadre e giochiamo a TABOO...con qualche cambiamento; i madrelingua inglesi giocano in italiano e i madrelingua italiani giocano in inglese! I giocatori fanno indovinare più parole possibili alla propria squada senza usare le parole vietate 'taboo'. (Ad esempio, bisogna descrivere 'arancia' senza dire: frutta, agrume, meccanica, rotonda, spremuta.) Ogni squadra consiste di un miscuglio di madrelingua inglesi e madrelingua italiani. La squada vincente a fine serata è quella che ha indovinato più parole. Ti porterà fuori dalla tua zona di comfort? Sì. Questo evento è adatto per chiunque abbia un'ottima conoscenza d'italiano e vorrebbe migliorare l'inglese, oppure chiunque abbia un'ottima conoscenza d'inglese e vorrebbe migliorare l'italiano. Ognuno paga la propria consumazione.